In a very special 2009 kickoff edition of Drum Corps International's official "Field Pass" podcast, host Dan Potter interviews legendary Hall of Fame chairman David Kampschroer ('85) to reveal the five newly elected members of this year's class. Download and listen. 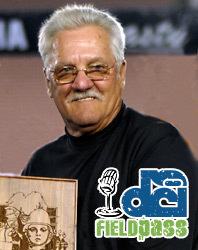 (MP3, 18:25, 16.8 MB) Learn more about the DCI Hall of Fame. Subscribe to this podcast through iTunes. RSS feed. Field Pass archive.